Shping started its life as the Authenticateit platform in 2012. Concerned about the growing threat of counterfeit and unsafe products entering legitimate retail situations, Shping’s founders developed a robust ecosystem that helped organisations to verify the authenticity of products through the supply chain, all the way through to the point of purchase. 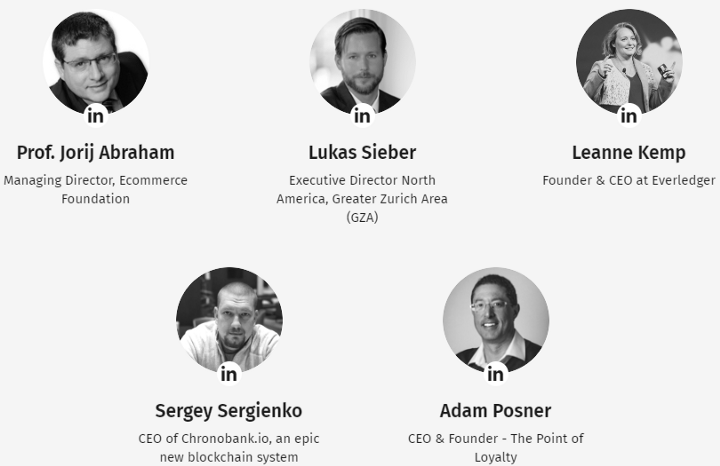 Shping is an innovative, shopper-marketing ecosystem that enables participating brands and organisations the opportunity to reward shoppers who use the Shping App with a new cryptocurrency called Shping Coin. By scanning product barcodes with the App, shoppers can reveal useful information, contribute product reviews, or activate actions set by brands to unlock more Shping Coins. For businesses, Shping offers a new way to market to shoppers at the critical point of purchase while enabling brands to gather analytics to help inform their strategic decisions. How will Shping Coin work? The Shping Ecosystem is built on product information provided by a scalable number of trusted and verified data sources. This includes data from participating brands, and a growing list of strategic partners including GS1 local members, certification and government authorities, product recall portals, and Everledger who have created a global, digital ledger that tracks, protects and stores the provenance of diamonds and valuable assets. Along with crowdsourced data (from Shping App users), the data is collected from these sources into a continuously updated, distributed product database; at over 30 million products and growing, it is on the way to becoming the biggest in the world. The Shping Platform is powered by Ethereum smart contracts and manages product traceability on the back of hyperledger and GS1 EPCIS standards. Shping will be partnering with Everledger to create a private blockchain based on the Hyperledger Fabric to play the role of a register for EPCIS events. The integration with Everledger is a work in progress. This allows information such as the serialization of products, item movements through the supply chain, and sales and product recall alerts to be exchanged quickly and securely. All brands, distributors and retailers can become a member of this network, start their nodes and use the EPC Codechain. Shping’s blockchain integration agent will provide blockchain information to consumers and third parties via EPCIS SOAP service. Buyers who purchase Shping Coins during the Token Sale will receive their tokens as soon as the transaction has been completed. Once the Token Sale has concluded, any interested party including brands, retailers and other users of the Shping platform may be able to acquire Shping Coins through accepting cryptocurrency exchanges (to be announced in early 2018). This diagram is for the purpose of detailing the potential interactions and flow of Shping Coins through various users. Actual movement of Shping Coins will depend on a number of factors, including brand and user uptake. Shping makes no representations that any of the users described will accept Shping Coins, that there will be any market or liquidity for the Shping Coins, or that any user will realise any benefit or gain from trading, exchanging or using Shping Coins. Neither Authenticateit nor Shping Co makes any warranties whether the Shping Coin may be listed on any cryptocurrency exchange. USA, China and New Zealand residents are excluded from purchasing Shping Coins during the Shping Token Sale. 42% of the total pool of Shping Coins (the Shping App Incentive Reserve) will be used to incentivize users and fuel the growth and performance of the Shping Platform. Shping Co and/or Authenticateit (parent company) may seek to acquire Shping Token distribution Token Supply: 10,000,000,000 Available for Purchase: 5,000,000,000 Initial Rate: 0.01 USD Presale Hardcap: USD $3 million Accepted Currencies: AUS Dollar (AUD) US Dollar (USD) Bitcoin (BTC) Ethereum (ETH) Ethereum Classic (ETC) Litecoin (LTC) Dash (DASH) Zcash (ZEC) Blockchain Integration The Shping Platform is powered by Ethereum smart contracts and manages product traceability on the back of hyperledger and GS1 EPCIS standards. Shping will be partnering with Everledger to create a private blockchain based on the Hyperledger Fabric to play the role of a register for EPCIS events. The integration with Everledger is a work in progress. This allows information such as the serialization of products, item movements through the supply chain, and sales and product recall alerts to be exchanged quickly and securely. All brands, distributors and retailers can become a member of this network, start their nodes and use the EPC Codechain. Shping’s blockchain integration agent will provide blockchain information to consumers and third parties via EPCIS SOAP service. The Shping Coin Economy Buyers who purchase Shping Coins during the Token Sale will receive their tokens as soon as the transaction has been completed. Once the Token Sale has concluded, any interested party including brands, retailers and other users of the Shping platform may be able to acquire Shping Coins through accepting cryptocurrency exchanges (to be announced in early 2018). Coins from a cryptocurrency exchange once the Shping App Incentive Reserve is depleted. Shping Coins that are unsold during the Token Sale will also be added to the Shping App Incentive Reserve. 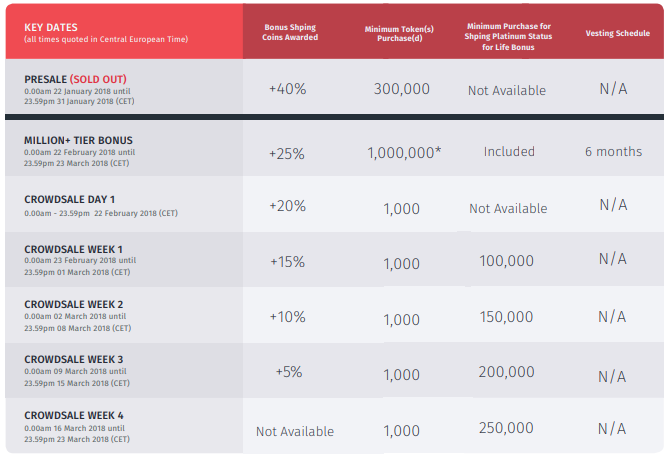 *The Million+ Tier Bonus is offered to purchasers who have acquired 1 million Shping Coins at the time of transaction or purchasers topping up their existing Shping Coin balances to meet or exceed the 1,000,000 Shping Coin eligibility threshold (not including any bonuses to be awarded on that purchase). For example, If a purchaser has 420,000 SHPING, they could purchase a further 580,000 SHPING to be eligible for the Million+ Tier Bonus with a 6 month vesting period on these newly acquired coins. The purchaser will then receive Platinum Status for Life and a 25% bonus on top of their 580,000 purchased SHPING for a total of 1,145,000 SHPING (725,000 of which will be locked for 6 months from the end of the Token Sale). Vesting Period for Tokens supplied to Shping Team & Advisers. The Shping Team and Advisers will receive their tokens in six (6) equal instalments over a period of three (3) years.